“Disney on Ice: Dare To Dream” will turn Royal Farms Arena into the Magic Kingdom from Oct. 11 -15 as an array of princesses and characters will teach kids to reach for the stars because no aspiration is ever too far away. Helping teach the show’s philosophy are Mickey and Minnie Mouse, as well as a Moana, Elsa, Anna, Rapunzel, Belle, Cinderella and many more Disney characters who will bring their stories, which many have seen solely in the movie theater or on TV, to life. 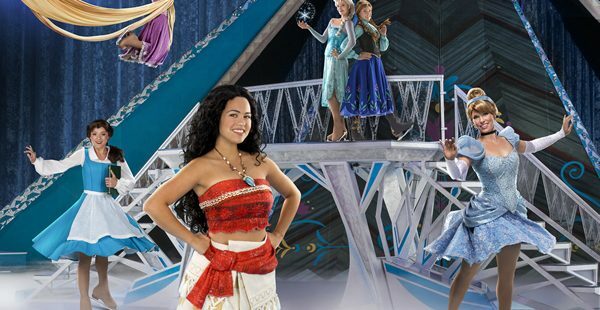 “Dare To Dream” combines “Moana,” “Frozen,” “Tangled,” “Beauty and the Beast” and other classic Disney stories that focus on the characters’ courage throughout a two-act show that features sparking costumes, elaborate sets and non-stop singing and dancing. Fans will see the length to which Moana will go with demigod, Maui, to save her island and discover her true identity, while Belle finds true love with the Beast. Sisters Elsa and Anna of “Frozen’ fame will show the strength of sisterhood as they try to prevent a world where winter never ends. Rapunzel, Cinderella and others will show that through dedication, determination and hard work, dreams can come true. The return of Disney on Ice to Royal Farms Arena comes as no surprise, as Disney has long been a part of the Arena’s decorated past. Since its first show in 1986, Disney on Ice has been a staple at the downtown relic on the corner of Baltimore Street and Hopkins Place, having stopped there more than 50 times, including two stints annually since 1995. Shows: Oct. 11: 7:30 p.m.; Oct. 12: 7:30 p.m.; Oct. 13: 10:30 a.m., 7:30 p.m.; Oct. 14: 11 a.m., 2:30 p.m., 6:30 p.m.; Oct. 15: 12 p.m., 4 p.m.
Tickets: $23-$78 and can be purchased here. ← Voters still love Hogan but will it last?